It was a pretty crushing assessment of Northern Ireland’s biggest political party from a man whose record in government is so distinguished that in 2014, when he finally retired from the frontbench, he was appointed a Companion of Honour. 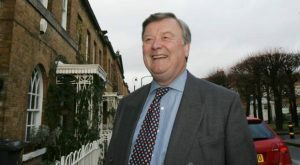 Ken Clarke, who has been in the House of Commons since 1970 and therefore bears the unofficial title Father of the House, is deeply respected and much liked. He was so impressive a minister in a wide variety of jobs, including Chancellor of the Exchequer, that he was in office throughout the 18 years of Conservative Governments, and was brought back as Lord Chancellor in 2010 when the Tories regained power. He always kept his sense of humour and found time for jazz, birdwatching, reading and watching football and motor racing. He probably would win a competition for the best Prime Minister we never had, as well as for the politician people would most like to have a drink with. He is also a man of great integrity who never conceals his unpopular opinions, which is why he lost three elections for the leadership of his party, which loved him dearly but could not accept his devotion to the EU. It was a tribute to his likeability that Nigel Dodds was so indulgent of him in his response. “He is in a club of one,” he said, referring to Mr Clarke in 2016 being the only Conservative MP to vote against the triggering of Article 50. He’s certainly dramatically out of touch with his party. The most recent poll of members showed only 15% were Remainers, with 23% in favour of Mrs May and her backstop and a whopping 57% in favour of a no-deal. In his year as Home Secretary, Mr Clarke was au fait with the security situation in Northern Ireland, and deplored terrorism of any kind, but he’s rarely shown much interest in the place. I’d guess his views on the DUP were formed from listening to the Rev Ian Paisley’s rantings during the 40 years they coincided in the Commons. Paisley did not quit as an MP until 2010. The problem with calling the DUP “a sectarian Protestant party” is that it implies singularity. The brutal truth, as we all know, is that politics here is almost all sectarian and reflects old tribal bitternesses exacerbated by decades of terrorism. Yes, there are many religious bigots who support the DUP, but these days most of the party leadership is thrilled when Catholics join it – as a few pro-lifers are doing – just as Sinn Fein longs to have more than the occasional token Prod. I’ve always found it irritating when Catholic politicians accuse Protestants of sectarianism and claim to be free of it themselves. Much of this misapprehension comes from remorseless nationalist distortion of a quotation of Lord Craigavon. In a speech in Stormont in 1934 on minority rights, Craigavon said he was Prime Minister “not of one section of the community but of all” and that as far possible he would see that “fair play was meted out to all classes and creeds without any favour whatever on my part”. Accused by a nationalist MP of speaking of “a Protestant Parliament”, he retorted: “They still boast of Southern Ireland being a Catholic state.